Forget the Census — Google may very well be the best way to get your finger on the pulse of a nation in this day and age. It's an unparalleled source of data that escapes the pitfalls of the observer effect, and search terms often have an uncanny ability to tap into both humanity's hidden psyche and current social and political mass trends. Though the decreasingly private nature of the Internet might make this a thing of the past someday soon, for now, people are searching their most honest questions and concerns without fear of judgment. When you take a look at those search terms on a global scale, the result is sometimes hilarious, sometimes a little sad, and always intriguing. Here in America, we're either really obsessed with Lil' Wayne or feeling kind of lonely (or possibly both). 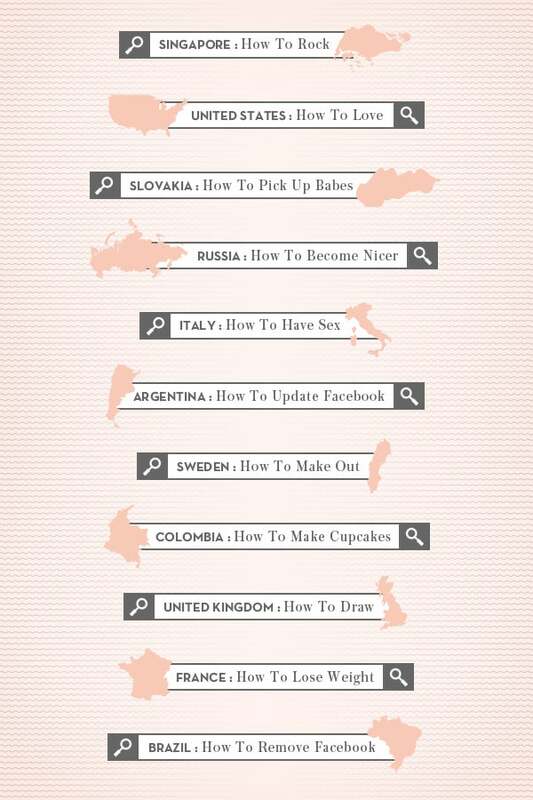 Singapore is awesome, Russia is working on self-improvement, and Colombia is just straight-up adorable. Here are the top most-notable searches that made our list — pretty telling stuff, huh? Data via Google Zeitgeist 2012.